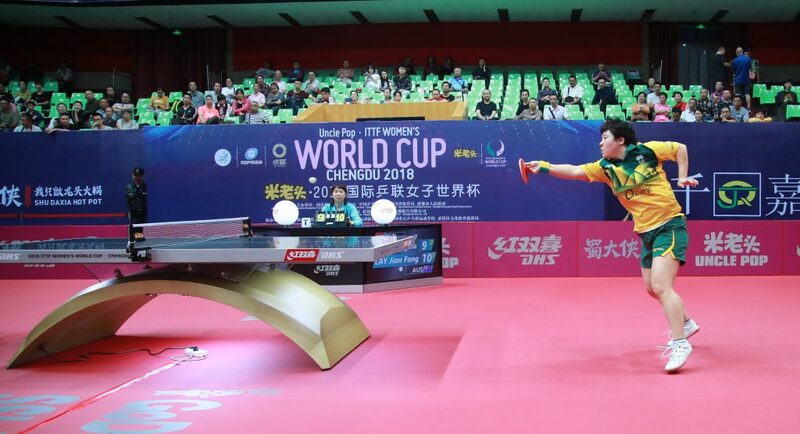 Jian Fang Lay’s crazy run at the 2018 ITTF Women’s World Cup came to an end yesterday in Chengdu, China. But it wasn’t without a fight. The Australian representative went down in the last 16 to World No.12 Suh Hyowon (KOR) in a seven game thriller, losing out 4-3 (11-6, 11-4, -11, 11-4, 6-11, 9-11, 11-6). In an interesting matchup of styles, the Korean defender narrowly ousted the unique pimple pen grip skills of the Aussie veteran. Jian Fang Lay recaps her history making run at the 2018 Women’s #ITTFWorldCup! It was an incredible two days of table tennis for the evergreen Lay. In the group stage she had caused a sensational upset by defeating World No.36 Georgina Pota (HUN) 4-1 (11-7, 11-6, 11-2, 10-12, 11-5). This had sealed her position as the number one in her group, landing Lay in the last 16 of the main draw. The amazing perfjoamcne perhaps was down to the appearance of some special fans. For the first time at a Women’s World Cup, Lay had her mother and sister in the crowd supporting. With results like this it may be worth bringing the duo along to all Lay’s events.